Cilantro Leaves (coriander) are seen often as a garnish with many Thai dishes. It is indispensable for Tom yam soup. As heat diminishes their flavor, coriander leaves are often used raw or added to the dish immediately before serving. 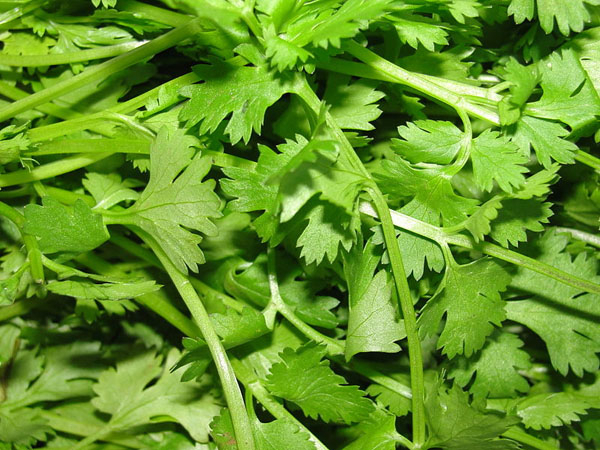 Coriander or Cilantro resembles some kinds of parsley, but the flavor is very different. Coriander roots have a deeper, more intense flavour than the leaves. (see Rak phak chi) They are commonly used in Thai soups and curry pastes.